A “hidden asset” at Citigroup has given the bank prime position in Wall Street’s fastest-growing business. The Treasury and Trade Solutions division is Citi’s crown jewel, pulling in $9.3 billion in revenue in 2018. 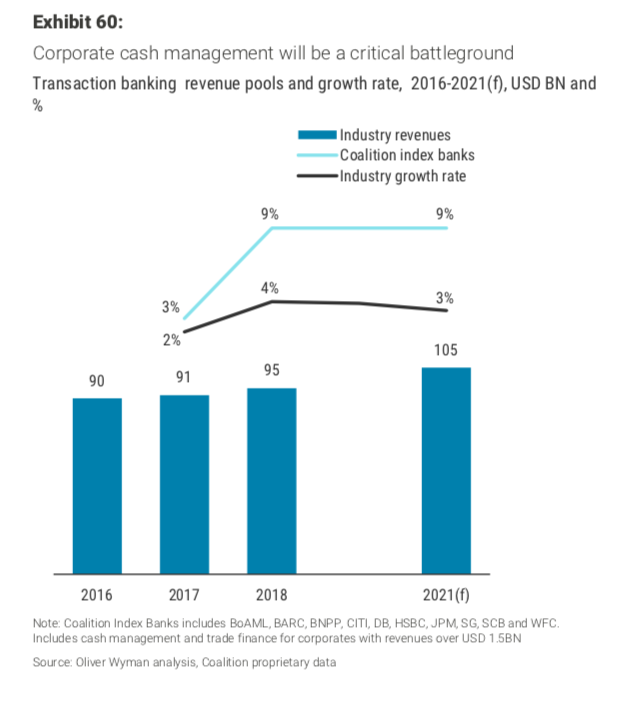 While less glamorous, transaction banking is a $95 billion a year market and will continue to be Wall Street’s engine of growth in the near future, according to industry research. Citi has for years dominated the field, and it’s treasury unit may be the secret weapon in unlocking the bank’s potential and satisfying investors like activist ValueAct. But other big banks are making investments and looking to dislodge Citi’s stranglehold over the top spot. One morning this January, Jim Cramer, the brash and voluble financial-television personality, hemmed and hawed on CNBC’s “Squawk Box” before the markets opened about Citigroup’s fourth-quarter earnings, which had been announced shortly before. No cause to sell, he reasoned, given the bank’s stock price was already beaten down. But no reason to buy either — aside from the beaten down stock price. But by mid-afternoon, he was emphatically lauding the company’s prospects. What changed his tune? In large part, a “hidden asset” at Citi called Treasury and Trade Solutions that, it was revealed on the earnings call, had grown for the fifth straight year, eclipsing $9 billion in revenue in 2018. Citi’s “hidden assets are probably worth so much more on their own than within the bank even as no one is talking about breaking up the company,” he wrote. The “Mad Money” host may be the most vocal to have taken notice, but he isn’t the first to have an epiphany over Citi’s transaction-banking business. Activist investor ValueAct Capital name-checked the division as a key advantage when it swooped in and announced a $1.2 billion stake in Citigroup last May. “A big part of our original investment thesis was related to that part of the business — that this is underappreciated about Citi,” said Conor Muldoon, a director and portfolio manager at Causeway Capital, which currently holds 5.7 million shares worth about $370 million. In public appearances, executives, including CEO Michael Corbat, highlight the unit as the backbone and crown jewel of the company. Citi doesn’t regularly break out the group’s bottom-line, but Naveed Sultan, the global head of Treasury and Trade Solutions, let slip at a conference in late 2017 that his remit had produced $3 billion of net income over the previous year — a net margin of 38% that well exceeds the bank’s as whole. While unglamorous and perhaps overlooked by the markets, the treasury franchise may be the secret weapon in unlocking the bank’s potential and satisfying investors — activist or otherwise. It’s an increasingly relationship-based operation and a feeding trough of business for the rest of the bank, according to Sultan. But Citi’s seat on the throne is coming under threat as big banks, including the likes of JPMorgan Chase and Goldman Sachs, have taken note of the transaction-banking treasure horde and are plotting to steal more of the riches for themselves. Who do you call to split up a $115 billion company that’s in 80 countries? Citigroup isn’t the industry’s top M&A bank. They don’t lead the league in advising IPOs, or trading stocks and bonds. But where they dominate is in transaction banking, holding the top spot on the industry league tables since Coalition, the industry data and consulting firm, began keeping score in 2016. Other corners of Wall Street may dismiss this business as the pipes and plumbing of finance, but it’s a $95 billion a year market — and it’s the fastest growing businesses in the industry, according to research from Morgan Stanley and Oliver Wyman. At the most basic level, Citi’s treasury and trade group is like a storefront local bank branch, but instead of managing everyday cash and credit concerns for you and me, they do it for the largest companies and government organizations in nearly 100 countries across the world. Part of Citi’s league table dominance is explained by its ability to cope with such messy, byzantine corporate needs on a massive scale. Take Hewlett Packard, for example. Back in 2015, the technology giant separated into two distinct entities, each boasting nearly $60 billion in annual revenues: HP, selling computers and printers, and Hewlett-Packard Enterprise, selling software, data-storage, servers, and other enterprise services. “It is the biggest separation that’s ever been done, and it’s not a typical spin off where you’ve got one big company spinning off a little part of the company,” then-CEO Meg Whitman told analysts after announcing the move. Much of the heavy lifting, and the more than $2 billion in costs, according to public statements and regulatory filings, went to third parties and contractors, such as Citi’s transaction-banking team. For Citi, the months-long job involved sorting out decades-old legal structures across 80 countries and 786 government jurisdictions, wrangling more than 1,500 bank accounts, and facilitating credit lines and other flows of cash across the organizations. And it had to happen while keeping HP open for business and without disrupting sales to customers. While Citi is equipped to handle the dirty work of bloated corporate divorces, such events are rare by nature, and most of the division’s utility comes from serving the everyday needs of giants like Boeing, Microsoft, or Walmart. At the industry’s 10 top banks, revenues grew 9% in 2018 to $31.3 billion, a rate Morgan Stanley and Oliver Wyman expect to continue through 2021. The broader industry revenue pool hit $95 billion in 2018. A majority of the big banks have seen double-digit growth in their transaction-banking businesses in the past two years and are plowing more capital into it in anticipation of further growth on the horizon, Eric Li, research director and transaction-banking expert at Coalition, told Business Insider. That means more competition for Citi. JPMorgan Chase, the No. 2 bank along with HSBC, is a powerhouse in North America, but has lagged beyond in other regions. It has its sights set on the top spot, investing in building a global challenger and successfully picking up more market share in Europe in recent years. Goldman Sachs, emboldened by the success of it retail-deposit gambit with Marcus, is planning on launching a cash-management businesses for corporations next year, betting its prestigious brand and tech savvy will trip up old-guard competitors. Threats could come from outside banking as well. American Express has ramped up its trade finance capabilities in recent years, as has Amazon, though primarily to small businesses that sell on its platform. And Citi still has areas where it can improve its market share, according to a February research note from UBS analyst Saul Martinez, including more penetration with multi-national clients, middle-market companies — where JPMorgan currently has an edge — and emerging companies with global aspirations. 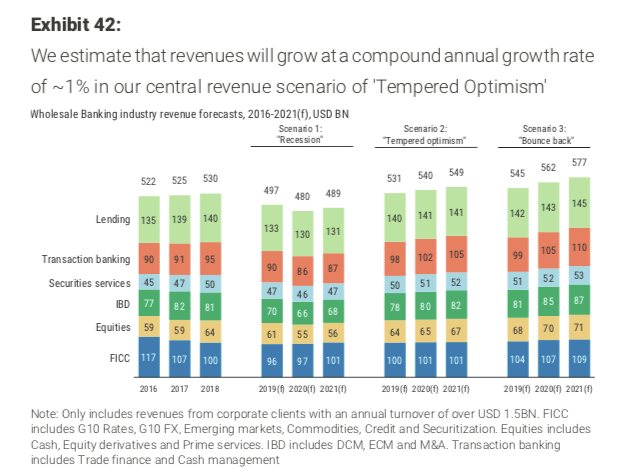 Sultan is mindful of the stiffening competition, but he’s confident the bank will not only hold would-be invaders at bay, but help the division keep up its streak of revenue growth. The battleground for this expanding revenue stream will be increasingly waged over the emerging markets and the budding unicorns popping up in every corner of the world — a critical growth opportunity. More than 85% of tech-enabled start-ups are “born global,” having at least one cross-border activity — whether that’s customers, users, talent, purchasing, funding, or mentorship — according to a McKinsey & Company study from 2016. And these companies are scaling into juggernauts with payments and trade financing needs in hundreds of cities across the world, ever quicker. Citi has won transaction-banking business with the likes of Uber and Airbnb, according to bank. But Citi isn’t the only one chasing such relationships. JPMorgan also has its eyes set on winning transaction-banking business from the next Uber or Slack in the fast-growing start-up world. And Goldman Sachs, which courts comparisons to Google, appear to be licking their chops at this opportunity as well. A distinct, top-flight tech platform may prove critical in deciding winners and losers, so incumbents can’t risk complacency, according to Morgan Stanley and Oliver Wyman. The surest way to lose the next generation of tech giants is with a glitchy, slow, or antiquated offering. With that in mind, Citi’s been investing in the treasury franchise’s tech capabilities, handling some $4 trillion worth of client flows every day, increasingly via tablets and smartphones. Earlier this year, Sultan’s team released a revamped digital onboarding process, marrying a digital interface with electronic signatures and documentation to trim the traditionally paper-heavy, time intensive ordeal down to a couple of days. Some of the more novel solutions of late have come in the payments and receivables division, an industry that has generally been slow to keep pace with the wave of technological change in the corporate world. In the past year Citi has partnered artificial-intelligence and machine-learning companies to release Citi Smart Match — which simplifies the painstaking and costly task of matching open invoices to received payments — and to add firepower to a tool that alerts companies to aberrant or suspicious payments. “Our strategy has to be to help our clients succeed in the digital age, and help them disrupt, rather than be disrupted,” Manish Kohli, a top deputy to Sultan as the global head of payments and receivables, recalled telling his team when he took the role in 2017. Xiaomi, which was founded in 2010 and already generates $27 billion a year selling smartphones and a bevvy of other internet-enabled devices, expanded into India in 2014 and subsequently relied on bespoke Citi TTS digital tools to set up accounts for their online marketplace in the country and to manage payments and receivables. Last year, Citi helped Deliveroo streamline its digital payments system as part of the food-delivery company’s continued expansion across Europe, the Middle East, and Asia. The payoff from such global client relationships is evident in the $9.3 billion in sales Treasury and Trade Solutions pulled in in 2018 — one quarter of the total revenue of the Institutional Clients Group — but the benefits aren’t confined to the division’s income statement. The group naturally dovetails with other business lines like FX and rates trading — Citi is a powerhouse fixture on the fixed income, currency, and commodities league tables — as well as corporate lending and securities services. Sultan has also knocked heads together with the firm’s investment banking and capital markets executives to better leverage their relationships. But despite some momentum in recent years, that business at Citi still trails the other big-four American investment banks. But for all the value Sultan’s empire is adding, within its division and beyond, Citi’s returns have lagged those of its big-bank brethren — though much of the blame has been pinned on failings within the firm’s retail-banking operation. Mayo has made a steady habit out of holding Citi management’s feet to the fire over its stubborn stock price as well as efficiency and return-on-equity that trail peers. But he sees the transaction-banking business having a dominant position versus its competitors, given Citi’s network, long-standing relationships, and the fact that others, like HSBC, have retrenched and ceded ground in past years while Citi held strong. “This is the vision of Citigroup playing out in a favorable way when so many times over the past four decades it has not,” Mayo said.